If you’re looking for a family weekend away with your grown-up children and grandchildren in tow which can offer something for everyone, Professor Ian Cooper discovers that Center Parcs’ newest site at Woburn Forest seems to fit the bill. With no fewer than five Center Parcs locations dotted around the country, I was offered the chance to sample its 362 acre Bedfordshire site with my family; six adults and four grandchildren whose ages ranged from a one-year-old toddler to a ‘grown up’ five! So just 40 minutes from London, was it really possible to survive the onslaught of family dynamics; the constant noise and relentless energy of several very little people with huge voices – especially at 5am! – and still come home feeling like we’d actually had a break? Actually, yes! Now let me give you five reasons why. I had cynically assumed before going, that the Center Parcs’ brochure and website was all marketing hype and gloss... but actually their claims about high standards of accommodation turned out to be absolutely justified. We had a huge two-level Executive Lodge, with four good-sized bedrooms all with en suite facilities... perfect for several family units. The spacious kitchen and dining area was clean and very well equipped with a dishwasher, microwave and two fridges for groups like ours who had taken enough food between us to feed a small army for a month! The only challenge in the kitchen, was the oven/hob which was so modern and ‘high tech’, that Doctor Who with his sonic screwdriver would have struggled to boil an egg on it! The lodge was fantastic for a short break and was almost a mini-entertainment facility in its own right. Once you had got bored with the ‘can you work the oven/hob challenge?’, telly addicts could watch one of the six TVs in the accommodation, go to the private ‘games room’ to play pool or make use of the extensive selection of board games. Perhaps the most luxurious and exclusive feature in the lodge was a private traditional wooden sauna cabin just beyond the patio doors. Unfortunately however, we were all just too busy for this… but it was really great for drying your wet towels! Parents and anxious grandparents will also be pleased to learn that despite the lodge having two levels, essential child safety gates had been installed at both the bottom and top of the stairs. Sometimes it’s the simple things that can stand out. When was the last time you, your children or grandchildren were able go cycling, without worrying about the traffic? One of the really unique and liberating things about Center Parcs is that apart from unloading your car on arrival and re-loading on departure, the park is a traffic-free zone. At Woburn you can enjoy the simple experience of riding around the woodland roads and tracks, trying to avoid the squirrels and frogs. There are a few places where the hills can be a bit challenging, but after succumbing to the temptations of the various restaurants, that was no bad thing. You can either take your own bikes or hire from Center Parcs’ massive cycle hire facility, where they will fix you and your kids up with appropriate cycles and helmets. They even have trailers or baby seats that attach to adult bikes for infants and two of my older grandchildren were able to get little ‘trikes’. When self-catering on the ‘space age’ oven/hob became too much, between us we checked out most of the restaurants. Though all of our eating out experiences were generally positive, three stood out. Firstly Strada (the Italian offering), where our noisy family lunch with two young children, two infants, three vegetarians and myself as a cynical travel and business writer could have given the Center Parcs’ ‘table staff’, blood pressure. Despite these challenges, the waiters coped efficiently and effortlessly. The menu was varied, food quality and service was very good and the safe ‘soft play’ area for small children, near our table, was really appreciated, particularly by their hungry parents! Secondly, I particularly, enjoyed the Indian cuisine restaurant, Rajinda Pradesh, where my wife and I spent an enjoyable evening away from the noise and organised family chaos! Even if the ambience and décor was not as Indian as you might expect, there was a very wide choice of dishes, delicious food that was well served and the package price for various inclusive choices made it great value. Finally, the Pancake House overlooking the lake and man-made beach, impressed us. Despite the fact that I sat down, grumbling to my family – “I’m not really a pancake fan … do we have to eat here?” – I left feeling very full, having been seduced by a huge tuna melt omelet, followed by some sort of luxury chocolate pancake desert covered in ice cream. The service was friendly and efficient and the experience very relaxing and enjoyable. Again, a soft play area was tucked away in the corner, to thoughtfully help keep my grandson away from my chocolate desert. Mini shopping trolleys: In the on-site supermarket, bright coloured mini-shopping trolleys are available, so that little people can join in the shopping experience with their parents. It totally works... I have an incredibly cute video clip of one of my toddler grandsons attempting to shoplift seven copies of a Peppa Pig DVD. Luckily we spotted this before he had got too far with his ‘getaway’! The footage could be a You Tube best seller. Restaurant facilities: Most of the restaurants have an abundance of well looked after high chairs, as well as something to keep kids entertained and many have soft play areas. Swimming: In what the Center Parcs marketing folk have called the Subtropical Swimming Paradise, not only is there a designated children’s area with fountains and various water attractions, they even provide free bright yellow safety swimming vests for little ones. Creche: My daughter gave me feedback that the crèche (known as the ‘Activity Den’) was excellent, in terms of organisation, facilities and the general peace of mind that she had when our youngest grandchild had a couple of hours there. The biggest problem in Woburn is… what next? Choosing from around 100 activities, requires some ‘project management skills and stamina’ and ideally some pre-online booking, to be sure you get the activities that you want to do. To give you a feel for the huge range, over the course of the weekend, my grandchildren had a crack at ‘fencing for tots; spent an afternoon learning how to be pirates and princesses; had a pottery class; went on an organised nature walk to find some ‘bugs’ and got covered in paint at ‘messy play’. As adults, though we didn’t have a chance to participate in the many sporting activities on offer, we did however manage some time for ourselves. Between us we went ten-pin bowling; played crazy golf and all the adult couples experienced a three hours visit to the Aqua Sana. This 7,200 square metres spa is Center Parcs largest to date. It has 25 experience rooms, two of which are the first of their kind in the world (the Mineral Room and the Sensory Experience). It is definitely well worth a visit. At the heart of the facility, just like all the other Center Parcs is the Subtropical Swimming Paradise, complete with rapids, thrill water chutes, wave machine, a lazy river and plenty of places to sit and relax amongst the 6,000 tropical plants. Within minutes of arriving home we had put our feet up and fallen asleep. The Center Parcs weekend with the grandchildren was exhausting, but great fun. It’s difficult to think of any other holiday in the UK, that comes close in terms of standards, facilities and range of activities. And it’s not difficult to see why this new Center Parcs site at Woburn Forest has attracted over 300,000 visitors since it opened a year ago and boasts an average 95% occupancy rate. Woburn Forest has 625 lodges, a 75-bedroom hotel and six Spa Suites. 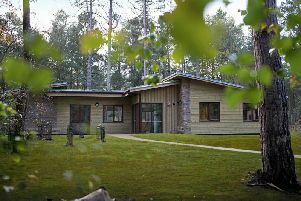 The lodges are a mixture of two-, three- and four-bedroom Woodland Lodges, two-, three- and four-bedroom Executive Lodges and four-bedroom Exclusive Lodges. As regards costs a three night weekend break in a four-bedroom Executive Lodge (for up to eight people) at Woburn Forest starts from £1,299. A short break in a two-bedroom Woodland Lodge (for up to four people) at Woburn Forest starts from £399. Also worth noting, for companies and organisations, looking for a venue with a difference for corporate events and meetings, Woburn Forest has dedicated conference spaces and appropriate facilities with special delegate rates. Professor Ian Cooper is an international business author and travel writer and to check out all of Center Parcs’ locations in the UK, visit www.centerparcs.co.uk or call 03448 267 723.